Addie Zierman’s faith journey has been about turning the stadium lights off, so she can reckon with her younger, more Jesus-y self. We don’t have to feel God, or even feel good, to still be near God and to be in his graces. My faith journey has been about not giving up during the disappointments, the delays. I’m a woman with hustle, the one who had a bachelor’s, two minors, and a master’s degree by age 23; a university teaching career by 24; professional interactions with lusciously elite writers and actors by age 26; national publications by 27. When I was 29, I fell in love and decided to lay down the bourgeoning career, the beloved city, and move with this man to a quieter city, without any promise of similar job opportunities. In looking back, which I sometimes do, I know I consulted God and can say with confidence that I believe He was leading me to marriage, to resigning, to moving, to accepting a different career path, perhaps because had I known what the next ten years would bring, I may have struggled with doing any of it. Even though my heart aches in recounting the circumstances of the past ten years, they haven’t been all loss. Tiny and colossal graces loop between the disappointments to sustain us, reminding us we’re not alone; we haven’t missed God or done anything wrong—even if those fears create occasional doubts. There have been God’s reassurances. See, I belong to an active, Spirit-led, totally unapologetically prophetic community. In varying degrees—from the bat dung crazy to the shout-out legit—I always have. Since our marriage began, my husband and I have had promises from God, supernatural encounters, even overt miracles that led our decisions and marked our paths. My husband received a prophecy at age 22 that God would send him to graduate school and pay for it; by 27, he had a paid-for doctorate. It really seemed as if God were with us. When we made our biggest by-faith decision four years ago to move to my hometown of Phoenix, little did we know we’d be facing a kind of soul-crushing, faith-shattering silence from God and the universe: my husband didn’t expect to be a stay-at-home dad and until recently my career felt like a cruel joke, the punchline of which was a paltry paycheck. Writing opportunities—which in the past felt lush—often feel sallow. Most heartbreakingly, and to use Addie’s expression, there have been interlopers—People-Who-Were-Not-Our-Spouses—who threatened to destroy us and our marriage. What I’ve realized in being the Good Christian Girl who married the Good Christian Boy who did all the right Christian Duties is that we’re still people, and we still have issues. When I became a believer at 18, during “confession” time I didn’t have anything to confess: I was too busy being good. And when good girls and boys discover that regardless of the degrees, the intellectual capacities, the prayers, the ministries, and the efforts, sometimes jobs don’t come, sometimes paychecks don’t pay, sometimes dreams don’t happen, and sometimes roles reverse, these good girls and boys discover they are angry. My anger startled me at first because it felt too much like sin. I didn’t want to admit my disappointment over circumstances, my confusion over how this was the result of years of obedient decisions. It didn’t take long for me to wonder if it wasn’t just life that was cruel but God himself. Alas, I am not a Calvinist. I am still an unapologetic Spirit-filled believer who believes God’s promises over my life will happen. It feels hard to believe, and sometimes others have to believe for me, but deep down I still hope. Here’s the thing: God doesn’t promise good jobs and healthy relationships; He promises wholeness, wholeheartedness. The past four years have brought these things about in deeper ways than I knew I needed—despite financial setback, miscarriage, autoimmune disease, business disappointments, ministry challenges, or marriage counseling. My heart may feel raw, but it also feels more whole. I haven’t found words to describe the wholeness because the rawness is too fresh. Perhaps it has to do with our finding true community, growing a surprisingly delightful family, doing more listening than speaking, and not trying to be good all the time. I think it also has to do with not needing to blame someone or some choice for our circumstances: I can’t blame my husband, or God, and even though it’s easy to take the blame, this assertion is not honest either. It has taken work to process out what I thought life would look like versus the reality, along with who I believe I am as a person. This has been healthy. Dealing with my issues has been healthy. Working through my grief has been necessary. Being truthful about how I feel with God, myself, and others has been healing. And the truth is, my soul and my faith are still intact—for the most part. 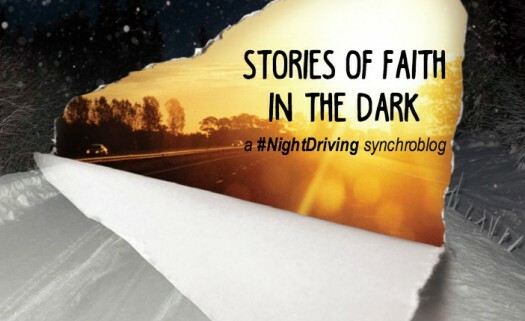 Read others’ stories of faith in the dark at Addie’s synchroblog. To seek out the roots of your own faith journey, consider joining us in May for Prism :: Roots Retreat. Bring your best girls with you and we’ll discover the deeper things of God together. “It has taken work to process out what I thought life would look like versus the reality, along with who I believe I am as a person. This has been healthy. Dealing with my issues has been healthy. Working through my grief has been necessary. Being truthful about how I feel with God, myself, and others has been healing. And the truth is, my soul and my faith are still intact—for the most part.” -Just about sums up my life. Thanks for your honesty. I’m heartbroken that this resonates with you so much but, for what it’s worth, you’re welcome. I love your honesty, and your acceptance of your emotions and circumstances without giving in to them. I’ve been thinking about that a lot over the past few weeks.